NUFRL filter + regulator + lubricator or filter/regulator piggy back set + lubricator. Port sizes 1/4, 3/8 or 1/2" BSP, NPT or Rc thread. Pressure range 0.5 to 10 bar, pressure tested to 15 bar. 40μm and 5μm PE or sintered bronze filter elements are easily interchangeable and replaceable. Drain is semi automatic standard, optional fully automatic or manual drain. Removes water and particle effectively, with high flow capabilities. Accurate and easy pressure setting. Polycarbonate filter bowl 105cc, lubricator bowl 125cc, option acid & alkali resistant bowls or aluminium bowl. 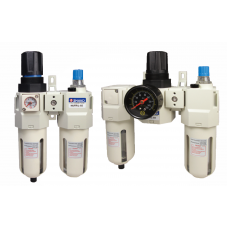 NUF Air FilterShako NUF-02-03-04 Port sizes 1/4, 3/8 or 1/2" BSP, NPT or Rc thread.Pressure ran..
Air Pressure Regulator Shako NUR-02-03-04Port sizes 1/4, 3/8 or 1/2" BSP, NPT or Rc threadPressure r..
Air Lubricator Shako NUL-02-03-04Port sizes 1/4, 3/8, 1/2" BSP, NPT or Rc thread.Pressure 0.5 to 10 ..
Air Filter Regulator LubricatorShako UFRL-02-03-04-06-08Port sizes 1/4, 3/8, 1/2, 3/4 or 1" BSP, NPT..
Air Filter/Regulator + LubricatorShako UFR+L-02-03-04-06-08Port sizes 1/4, 3/8, 1/2, 3/4 or 1" BSP, ..
Air Filter/Regulator Lubricator Shako UAC30-02-03Port 1/4 or 3/8" BSP, NPT or Rc thread40μm an..
Miniature FRL Combination Shako FRL700C-01-02 FRL600C-01-02700C F+R+L, 600C F/R+L Port sizes 1/8" or..
Miniature FRL CombinationShako FRL700A-01-02 FRL600A-01-02Filter/Regulator lubricator (700A), Filter..